Although iTunes usually does a great job to back up and restore data on your iPhone, the backup is a kind of inaccessible and unreadable SQLITEDB file. What if you want to explore and view the files in the backup, or you prefer to recover certail files but not all of the data from the backup? Read on to find out how. – A PC with latest iTunes installed. – A recent iTunes backup file. – Free iPhone Backup Explorer. 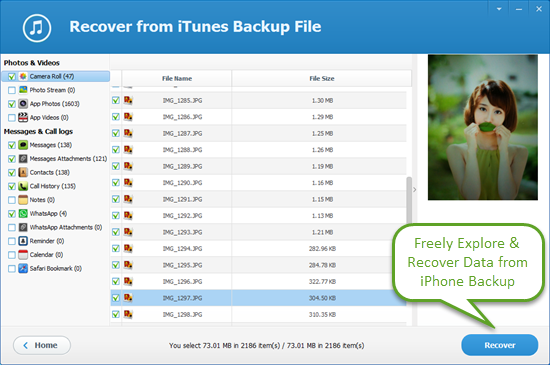 Free iPhone Backup Explorer is a clean and safe tool that helps you explore your iPhone, iPod touch and iPad backups. 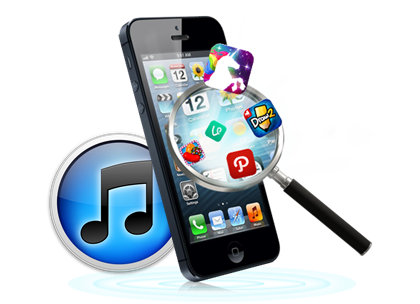 The application provides an easy way to explore and check the contents of any iTunes backup file. It is meant to be used by anyone that wants to easily view and save data from iTunes backup to computer. – Securely explore all iTunes backups created for iPhone 6S, iPhone 6S Plus, iPhone 6, iPhone 6 Plus, iPhone 5S, iPad Pro, iPad Air 2, iPad mini 4/3, the new iPad, iPod touch 5, etc. – Freely access to any iTunes backup and restore iPhone data like photos, videos, contacts, messages, call logs, notes, WhatsApp, and more. – Conveniently preview all contents in the scan result and selectively recover what you exactly want. – Easily export all data into readable formats like TXT, XLS, CSV, HTML and safely save them on your computer. Before proceeding, we kindly remind you not sync your iPhone to iTunes if you want to explore and recover data from the existing backup. Download, install and run this iTunes Backup Explorer on your computer. Then select the backup file you wish to explore and click “Next”. Select the files types you want to explore and click “Next”. After scanning, view and check the contents in the scan result. Simply select the files you wish to export to computer and click on “Recover”. Then choose the location where you want to save your files and click “OK”.